At Fence Workshop™ of Raleigh, we specialize in providing a wide range of access control system solutions. We carry a variety of options so that you can find what level of automation you need for your property. At Fence Workshop™ of Raleigh, NC, we supply access control systems for gated areas throughout the entire city of Raleigh. No matter where you’re located, we can deliver both a beautiful estate gate as well as the automation materials you’ll need to get it opening and closing with ease. Fence Workshop™ can help with all of your commercial or residential access control systems and help you customize the perfect solution for you. Check out the variety of access methods below. Keypad Entry Card Entry Transmitters (Clickers) Keyless Entry KeyPads Keypads require a unique combination of buttons pressed to deactivate an electric strike or magnetic lock. Key pads allow access without the necessity of carrying keys, cards, or any other type of product. They can also be programmed to alert you after a certain number of incorrect key strikes are attempted. Card Readers Card Readers themselves have internal memory for storing information like biometric data or access codes. They can be contact smart cards or non-contact, or contactless smart cards. Contact smart cards need to be swiped, while contactless smart cards don’t even need to be removed from a wallet or purse to be used. 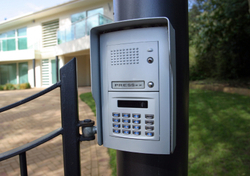 Transmitters (Clickers) Transmitters, or “clickers,” are one of the most popular methods of access control for gate openers. Transmitters are easily added to a key chain or clipped to the visor of a car and allow users to open and close a gate with the push of a button. Keyless Entry Installing a Keyless Entry System in your home business or industrial complex can greatly decrease your access control problems. Instead of issuing a key for every person that needs to get on and off a property you can assign an individual fob or key code, thus allowing for easier/more streamlined access control. With the peace of mind form knowing your keys will not be lost or stolen you can forget the headache that comes from issuing countless keys to numerous people. Get Started – Plan Your Gate Project Now!